Scientists understand a great deal about the importance of diversity. Diverse ecosystems are more robust and resilient; genetic diversity is essential for evolution and adaptation; diverse data points make a more reliable study. Diverse viewpoints also make for higher quality work. 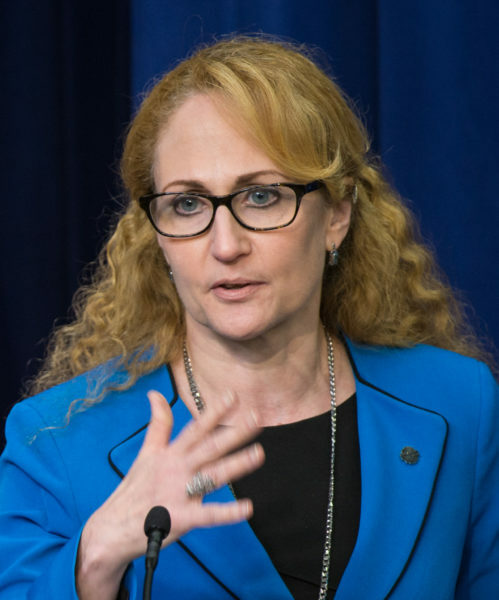 “It’s our strength,” Dr. Jo Handelsman said to a room full of students and faculty on Tuesday, October 17th. “That’s what diversity is.” Despite all this, scientists are falling short in achieving diversity amongst themselves. Dr. Handelsman’s talk, “The Fallacy of Fairness,” was this quarter’s WINS event — the WISE Inspirations Network at Stanford (WISE being Women in Science & Engineering). Dr. Handelsman is the former Associate Director for Science at the White House Office of Science & Technology Policy, and 2011 winner of the Presidential Award for Excellence in Science, Mathematics, and Engineering Mentoring. She began her talk at Stanford with this simple, but powerful, reminder. Diversity is our greatest resource in Science, Technology, Engineering & Math (STEM) but a resource that we are failing to utilize to its full potential. “In science, the pay gap is even greater than it is in the United States generally. And that is just appalling,” Dr. Handelsman recounted. Among scientists and engineers employed full-time in the U.S., the salaries of men with bachelor’s degrees were 18% higher than women’s in 2008. This finding held true across all age groups — it was not a question of seniority. The biases that result in unequal pay and skewed hiring practices have been well-documented. There is real, scientifically rigorous data to support this. After receiving continued complaints that faculty were not being paid appropriately, one department at an unnamed major research university had a group of outside evaluators rank each of its faculty members on a competence scale, to see how faithfully pay correlated with the quality of the work being done. The results showed that, for women, there was no correlation between ranking and pay. Female faculty were all paid similarly (and more modestly than their male colleagues), regardless of their distribution on the competence scale. For the male faculty, the results showed a clear upward trend — as one would hope to be the case, generally — higher competence translated to higher pay. Dr. Handelsman referred to this statistical finding as “kind of satisfying to see.” The data effectively put bias into indisputable terms — terms that scientists couldn’t help but reckon with. This study is part of a robust body of research exposing manifestations of bias in academic science. The satisfaction derived from quantifying these biases and putting them in plain sight is undercut, of course, by the knowledge that this is a harsh reality for women and minorities seeking employment and recognition in STEM fields. One particularly interesting study that Dr. Handelsman shared was on the influences of gender in tenure decisions. No major differences have been found in a professor’s likelihood to achieve tenure based on gender — and Dr. Handelsman added, “this is where people start saying ‘we’re really getting better at this. This is good.’” However, a deeper dive into the way tenure evaluations were handled revealed even more insidious biases at work. Researchers noted four times more “cautionary comments” on women’s tenure applications than men’s — in other words, evaluators noted things like, “the work will have to speak for itself,” or “we’ll need proof that she was in fact a major player in this research, or in securing this grant.” These findings speak to the pressures on women in scientific fields — the continual need to prove themselves in the face of doubt. When there are two names on a grant, or two principal investigators on a study, the general assumption will be that the man did the bulk of the heavy-lifting, so to speak. Dr. Handelsman notes that this idea is not only biased, but actually dead wrong. In cases where women do receive credit, they’ve usually worked the hardest to get it. Another interesting facet of how unconscious biases play out is that results do not seem to change when women are evaluating other women. “In none of these studies have I seen a significant effect based on the gender of the evaluator,” Dr. Handelsman stated. Women are just as likely to be biased towards other women and minorities as their male colleagues are. An important aspect to remember in all of this is that unconscious biases don’t just hurt women and minorities. When the meritocracy is a myth, we all lose as a result. In many cases, unconscious biases lead to what we might call “the wrong conclusion” — the less qualified candidate gets hired; the less deserving researcher receives a grant. This is harmful to science, and scientific progress. So, what can be done to correct these trends? As Dr. Handelsman notes, “It’s very hard to change the biases themselves, but we can change actions by making people conscious of their decisions.” One good practice is identifying clear hiring criteria before evaluating candidates, which tends to reduce the opportunity for unconscious bias to take over. Dr. Handelsman also stated that “one of the simplest, but most time-consuming things you can do” is to work directly with girls at vulnerable ages — typically middle and high school — who are in danger of leaving science. To counteract the accumulation of subtle biases that convince so many young women and people of color that they are unsuited to STEM fields, it’s essential to introduce them to mentors who are like them — especially mentors who demonstrate that it is indeed possible to do other things that young people want to do, like have a family, while still having a successful career in science. “Give them role models,” Dr. Handelsman said. Stanford offers a number of fun and fairly low-commitment opportunities to engage with youth — from Splash to science pen pal programs. There are also ample tutoring and mentoring positions for Stanford students, some paid and some voluntary. It’s a great idea for anybody who loves what they do and wants to share that passion with people who will soon be making a difference in the world. It is, however, especially crucial for women and minorities in STEM fields to show their work to young eyes. The more vocal we are about women and people of all different background excelling in science, the more normal that excellence will become.